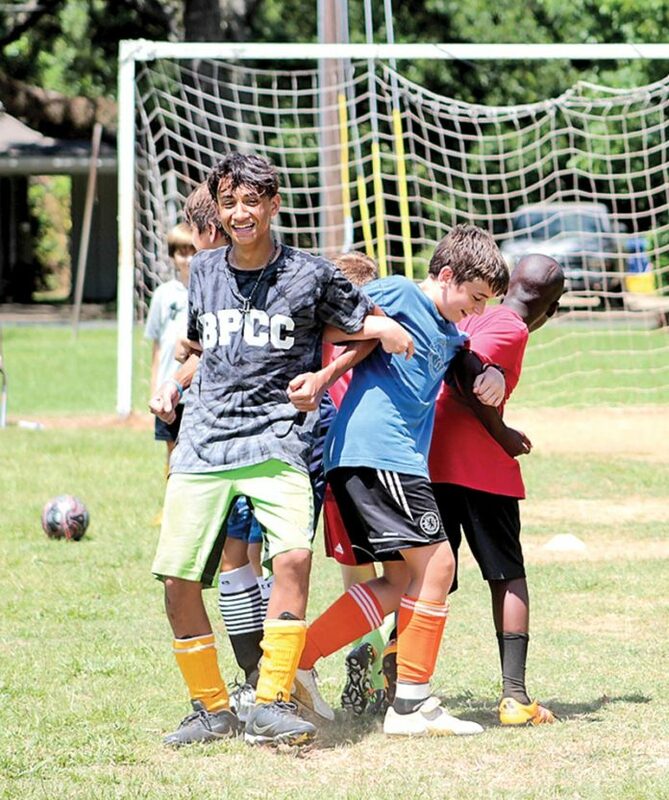 Visiting Natchitoches for over a decade, the Challenger Sports British Soccer Camp continued to develop players’ skills, speed and confidence for those of all abilities. This camp provided players in Natchitoches with high-level soccer coaching from an international coach July 24-28. In addition to teaching new skills and improving game performance, the athletes were taught lessons in character development and cultural education through games. One game the participants played was a revised version of sharks and minnows. The instructor gave the sharks certain rules they had to follow during the different rounds to make stealing the “minnow’s” ball more difficult. In the photo above, the sharks had to link arms and run as a group. Joshua Chesal takes off down the field during a scrimmage once he gained possession on defense. Reeves Hogg races with him, cutting off his inside passing options. Aiden Bush dribbles quickly towards the middle of a cone circle to grab one, representing treasure, while racing against the other team. During a camp scrimmage, Clarke Glenn executes a cryuff fake trick while being pressured by Ian Murchison as Logan Carter supports him to the side, giving him a pass option. From left are Murchison, Carter and Glenn. Toby Adeleye sends a powerful shot into the net during a game of Lightning.